Swimming pools aren’t just popular in South Florida, they’re practically essential. But simply owning a swimming pool isn’t enough. You also need to maintain it properly so that it enhances both the appearance and value of your property. A poorly maintained pool can harm your property’s worth. There’s nothing more damaging to your reputation than having a pool that is cloudy, underfilled, or tinged green with algae. Not only is it unsafe, but it’s also can affect the way people see you. In South Florida, your swimming pool can literally make or break your reputation. Whether you are a homeowner, operate a hotel or residential property, or manage of an exclusive club or spa, it’s important that people are impressed by your pool. A consistently clean, shimmering pool in pristine condition reflects positively on your status. Maintaining or servicing your pool on your own often isn’t the best solution. Not only is it a lot of work but keeping up with all the required tasks takes time away from your already busy life. Plus, if you don’t have the expertise and experience in pool maintenance and repairs, you can often end up making your pool look worse, not better. That’s why you need a professional, experienced pool maintenance company that can not only make your pool look its best but also enhance your status and reputation. The smallest crack or pinhole in the surface of your pool can have devastating results and cause costly damage. At Tropics Pool and Spa, our pool experts can detect and repair pool leaks immediately before they have time to cause serious harm. Tropics Pool and Spa is the pool service company of choice for top-tier homeowners, business operators, and club managers in South Florida. We service some of the region’s biggest names, providing top-quality, professional maintenance, repair, and pool care with optimal discretion. You’re too important to take care of your pool on your own. 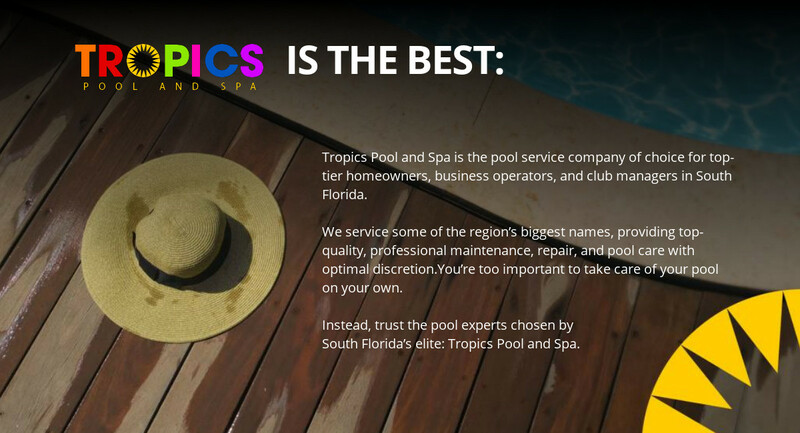 Instead, trust the pool experts chosen by South Florida’s elite: Tropics Pool and Spa.